We are proud to stand behind the quality of every Nomader® Collapsible Water Bottle we sell. To show our commitment to quality, we offer a lifetime warranty that covers manufacturing defects in materials and workmanship for the lifetime of the bottle, valid to the original purchaser or the original gift recipient. Other than to the original gift recipient, this warranty is non-transferrable, and is only redeemable through Nomader for purchases made from Nomader. Our warranty does not cover damage caused by improper care or use, negligence, accidents, or normal wear and tear. 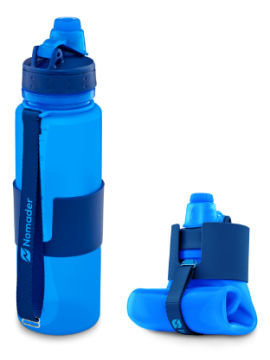 To register your Nomader Collapsible Water Bottle's lifetime warranty, please complete the below registration form within 90 days of purchase. If you ever discover a defect with your bottle, we will have your information on file to assist with your claim. If you need to make a warranty claim, please scroll down to the next form. *If your bottle was purchased on Amazon, the 17-digit Order ID can be found within "Your Orders" when logged in to your Amazon account. If you believe your Nomader bottle has a manufacturing defect, and you have already registered your lifetime warranty (see above), please submit your warranty claim below. Use the description field to include details about the issue you're having so that we can better assist you. Prefer to speak with us by phone? Please call 1.800.213.7052. Upon receipt of your claim, we may request that you return your bottle or provide pictures of the issue for evaluation. Once we determine that the bottle is defective, we will either repair or replace it, and ship to you free of charge. If we no longer make or sell your warrantied bottle, we will replace it with a similar bottle of equal or lesser value. Nomader and Nomad are registered trademarks of Nomader, LLC. Amazon and the Amazon logo are trademarks of Amazon.com, Inc. or its affiliates.